Using melon baller, scoop out center of each watermelon cube from top (about 3/4-inch deep), and reserve for another use. Transfer watermelon cups to serving platter. In medium bowl, mix strawberries, olive oil and salt. Spoon strawberry mixture into watermelon cups. Top with cheese and shredded basil. 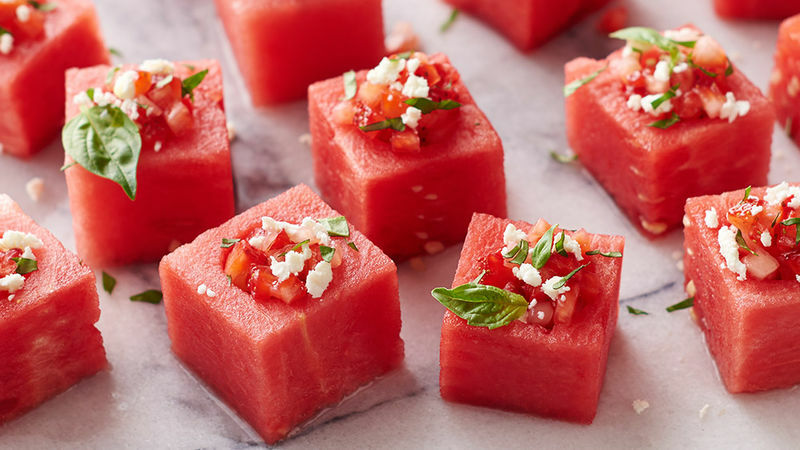 Be sure to cut the watermelon into at least 1 1/2-inch cubes so the melon baller doesn’t cut through the sides of the cups. For a little extra sweet and tart flavor, serve the cups drizzled with a balsamic reduction. In 1 1/2-quart saucepan, heat 1/4 cup balsamic vinegar to a simmer over medium heat; cook 2 to 3 minutes or until reduced to 1 tablespoon. Remove from heat; cool.